UPSC Prelims 2017 Exam GS Paper Analysis & IAS Exam Strategy | IAS EXAM PORTAL - India's Largest Community for UPSC Exam Aspirants. With UPSC prelims 2017 paper, UPSC has again proved the unpredictability of the civil service prelims exam. 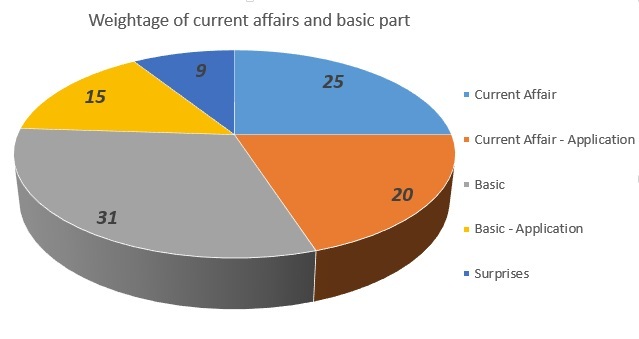 While last two years saw the share of direct current affairs based question increase, 2017 exam year upsc question were bit tricky and not directly based on the facts as in case of 2016 paper. Many of the question required serious brainstorming and therefore for many two hours might have proved to be insufficient. This article tries to go into the depth of last year paper and see how a candidate can calibrate her/his approach for such surprises in the exam hall. No singular pattern about the weightage of the subject can be discerned from the above chart. Point to be noted my lord!! The attitude of leaving one or two low weightage subjects based on the previous year papers is not at all fine with UPSC. It loves to surprise the candidate and therefore when you might have thought that S&T does not matter that much anymore, UPSC 2018 paper may house more than 15 questions as in case of polity this year. You have to be battle ready for any kind of Thali that UPSC will serve to you on the D-Day!! Should I focus on the fundamental part or the current affairs? This is the most common doubt for every aspirant. There is no definite answer to that nor there can be unless UPSC comes out with a white paper on the subject (Which we know is never going the happen). 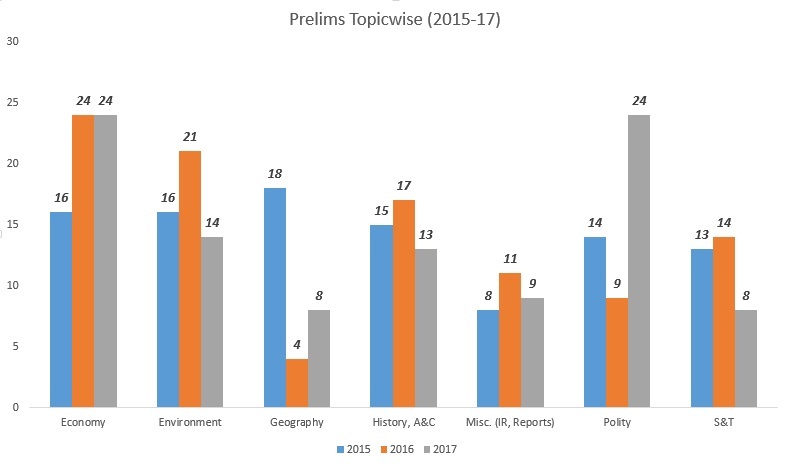 While UPSC 2016 paper was heavily skewed in the favor of Current Affairs, UPSC 2017 paper tilted towards the fundamental part as can be gauged from the increased share of polity. (a) Certifying the skills acquire by construction workers through traditional channels. Often covered in daily news. A direct question from the newspaper. (b) It no longer exists in the wild, a few individuals are under captive protection; and not it is impossible to prevent its extinction. and other animals that are covered under the schedule. depth knowledge of the subject. Read the NCERTs thoroughly and revise them at least one. If possible underline the important concept or make note out of them. you can consider NCERT Notes for UPSC exams to cover everything easily. Read only one reference books for every subject and revise it again. Selected candidate have always emphasized on this aspect of the preparation and is relevant for both upsc mains and prelims equally. It is a common mistake to burden oneself with too many thick books and ending up with zero retention of what one had read in those books. Pick up one newspaper like The Hindu or in case it is not available them Indian express and make a habit of reading it thoroughly every day and make notes out of it. These notes come in handy in the last month before prelims where focus has to be on revision. Go through IAS EXAM PORTAL daily current affairs and daily quiz based on current affairs. Go through them and note the concepts that you might have not covered in your newspaper. If possible go through the latest economic survey and budget speech which will cover all the important relevant concepts of economy as it has been a direct source of many questions in the past like these. If for some reason it is not possible to go through the eco survey cover to cover then do go through at least 2 summaries of the budget and eco survey as they cover important schemes as well. In the immediate month previous to Prelims exam (May), don’t go for any new material and rather focus on revising the notes that you had made from newspaper, books etc. At the same you must practice, a lot!! Solve as many UPSC mock tests as you can. This will help you in gauging your preparation, help identify the weaker parts and put you in a mindset for the exam.